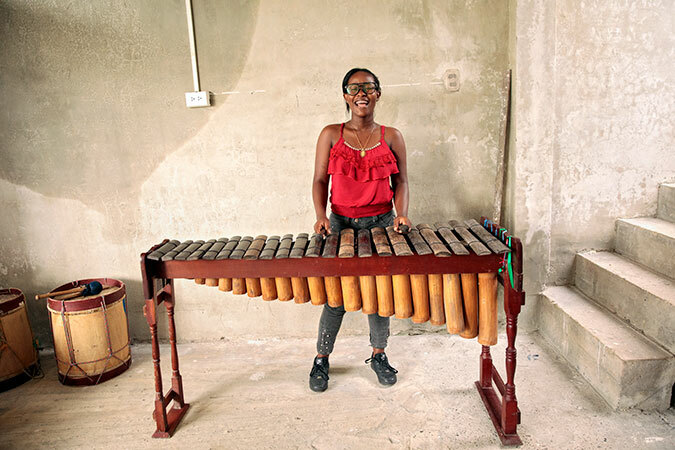 Supported by a UN Women program, the Cantadoras have engaged young people in the port city of Tumaco, where decades of armed conflict have torn apart communities, and peace is still a long journey. "When I listen to a drum, I feel like it’s calling my name. This music is in my veins. Through the lyrics of the songs we sing, we are telling the real stories of our lives. When we sing, we feel free. Once you join the Cantadoras group, you don’t think about weapons anymore, because the free time and the emptiness you felt in your life is now filled with music. Last year, in July, there was a conflict between the guerillas and the army. Two young people died that day, one was my cousin, and the other was a musician I knew. They were in their twenties. I was at the cemetery during the burial. Next to me stood a woman. A young boy came into the cemetery and shot her dead. She fell near my feet. For the first five minutes, I just stood there, paralyzed with fear. Then, I ran. This is my reality. The young people in my community need safe spaces and opportunities to do things they like to do, like sport, music, painting; they need work. Because they are unemployed, they look for easy ways to make money. I think, instead of grabbing a notebook, they grab a weapon." Mila Mosquera Rodriguez, 18, lives in Tumaco, a municipality in the Pacific coast of Colombia. Tumaco is a major producer of coca leaves, and a hub for drug trafficking. Decades of armed conflict and violence triggered by the drug trade has torn apart families and communities. As part of UN Women’s “Women Peacebuilders Program”, funded by the Government of Norway, UN Women supports the CANAPAVI Foundation that’s strengthening the capacities of women cantadoras to highlight and preserve their role as peacebuilders through traditional Afro-Colombian music. Mila Rodriguez’s story shows the importance of engaging women and youth to fulfill the vision of Sustainable Development Goal 16, which aims to build peaceful and inclusive societies.